The first kidnappings happened two hundred years before. Some years it was two boys taken, some years two girls, sometimes one of each. But if at first the choices seemed random, soon the pattern became clear. One was always beautiful and good, the child every parent wanted as their own. The other was homely and odd, an outcast from birth. An opposing pair, plucked from youth and spirited away. 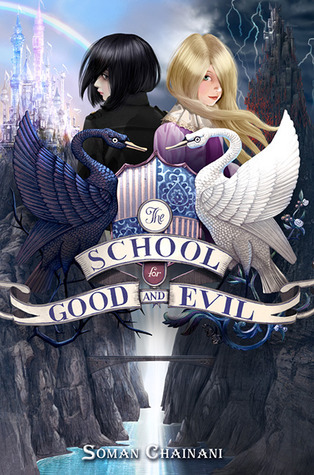 The School for Good & Evil is an epic journey into a dazzling new world, where the only way out of a fairy tale is to live through one. Whoa I knew I had heard good things about this book, but I honestly didn't expect it to be THIS good. The School for Good and Evil is so incredibly imaginative- the world building in this book is, in my mind, with the likes of the Harry Potter series. The author has created a world with such intricate detail and creativity- I adored it! The book centers on two main characters, Agatha and Sophie. Agatha is homely and has a witch for a mother. She is doesn't like boys and enjoys doing things that others would consider gross. Sophie is a true girly girl. She is obsessed with makeup and potions to keep her flawless. Her favorite color is pink and she knows she is destined to be a princess. But when the school master comes and whisks them away- things aren't what they seem and they are placed in the wrong schools (or so they think). I loved Sophie and Agatha- I loved that we got to see both sides narrate the story and that they both had such strong voices. I spent the entire book not knowing who to root for and wanting to root for both girls. I can't say anything about the ending- other than it was awesome! If you are a fan of fairy tales, fantasy, or books that completely take you into a different world- then this book is for you, hands down! I'm in the middle of this right now! I've enjoyed it so far, but I feel like it's trying almost too hard to be like Harry Potter. Still, it's super imaginative and well-written. Lovely review!